Silicon Valley health IT startup Castlight Health (@castlighthealth) announced it has closed a $100 million Series D round, bringing their total capital raised to $181 million, leaving it poised for acquisitions or an IPO. 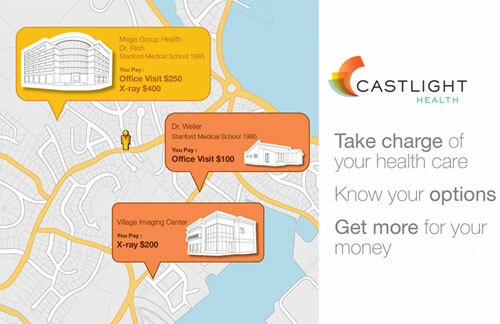 Castlight has been pioneering the use of price transparency and comparison tools in health care, offering a B2B service that enables self-insured businesses to provide their employees with tools to compare costs and quality of a wide range of tests and procedures across providers. Castlight even counts provider Cleveland Clinic among its financial backers, and the Wall Street Journal has called Castlight the #1 venture backed business of 2011. The latest round was led by two “major” mutual funds, with contributions from T. Rowe Price, and Redmile Group. Castlight’s previous investors include Morgan Stanley, Wellcom Trust, US Venture Partners, Maverick Capital, Oak Investment Partners, Venrock, among others. The company has remained largely under the radar, focusing on its ten or so core clients, which include Honeywell, Life Technologies, insurance broker Willis North America, and grocery store chain Safeway. The company charges its employer clients by employee per month. Speculation is that the next step for the company will be an IPO, though perhaps not in the immediate future. According to Forbes, the company still has most of the $81 million raised in the company’s first three fundraising rounds in the bank, which leads me to believe this huge raise will be used to execute on strategic acquisition opportunities. The company will also probably add to its staff of approximately 100 and expand its footprint well beyond Silicon Valley. TechCrunch puts this down as one of the largest venture investments in a health IT company to date, which is probably correct. Another interesting way to look at the staggering fundraising round is to divide it by their total number of followers on Twitter, arguably a decent way to gauge the company’s digital influence, which comes out to $148,809/follower. To put this in context, even if Facebook is able to raise $10 billion dollars in its IPO later this month, that would only break out to be approximately $12.50 for each registered user.